Two days after the Library Gardens balcony collapsed I visited the memorial for six of its young victims. I saw the news on Twitter around 6 am the morning it happened on Tuesday, June 16th. I resisted the impulse to go there and film knowing I’d feel more like a gawking tourist than a local filmmaker. If I find myself close to breaking news around town sometimes I’ll tweet photos. I’m not in a rush though to play citizen journalist when the story involves thirteen young adults falling from the 5th floor of an apartment complex next to Berkeley’s Central Library. I didn’t want to see one of my city’s favorite gathering spaces through the lens of tragedy and death. I didn’t want us to be responsible for losing these kids. Nor could I look away and deny it. I turned to the city’s best news source, Berkeleyside (where I used to work) and followed the outpouring of tweets on my favorite Twitter hashtag and the #BerkeleyBalconyCollapse thread. As the producer of Quirkeley’s video series, #Berkeley, I’m glued to Berkeley feeds on social media, scouting them for inspiration. For this Berkeley resident (who doesn’t have cable) it’s a seductive, unpredictable mosaic of local identities and places to be – or avoid. The most Instagrammed pictures of the city typically are of the Campanile, CREAM Ice cream, sunsets and squirrels. On weekends The Rare Barrel brewery and concerts at the Greek take over. Just last week the city trended when Goats Gone Wild, a Berkeley Lab video of hundreds of goats crossing the road, went viral. It’s not all peace pipes and Smoke’s Poutinerie. Berkeley’s vociferous and controversial character is world renowned, yet I’ve never seen the city impacted by a tragedy of this magnitude. #Berkeley on social media was frenetic, simultaneously mourning “The Berkeley Six”, celebrating The Warriors championship and crucifying the New York Times for its appalling 2nd day coverage of the tragedy which appeared to blame the victims. 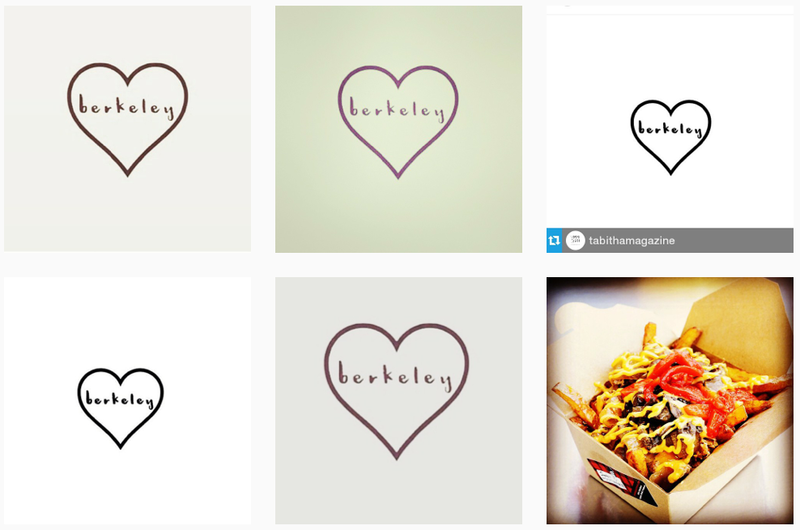 One of the week’s most shared images on #Berkeley Instagram was of Berkeley spelled out inside of a heart shape. Sara Prender appears to be the first to have posted the image Tuesday. By Thursday the time had come for me to put away the social media filter and pay my respects to Olivia Burke, Eoghen Culligan, Niccolai Schuster, Lorcan Miller, Eimear Walsh and Ashley Donohoe. Library Gardens is two blocks from my office. It was quiet when I arrived. A couple of news trucks were parked across the street. I purchased a generic, plastic-wrapped Wallgreens bouquet and anchored it among the growing wave of blooms, messages and flickering candles, disappointed that I didn’t bring farmer’s market flowers. I bowed my head and closed my eyes. I’ll never comprehend this loss, what the families and friends are going through or how this could happen in my town. Berkeley’s new bond with Ireland is profound. Eternal. I opened my eyes relieved to see more people arriving with flowers from Walgreens. The Irish flag waved in the breeze. I returned to my office and the virtual sacred space of #Berkeley. 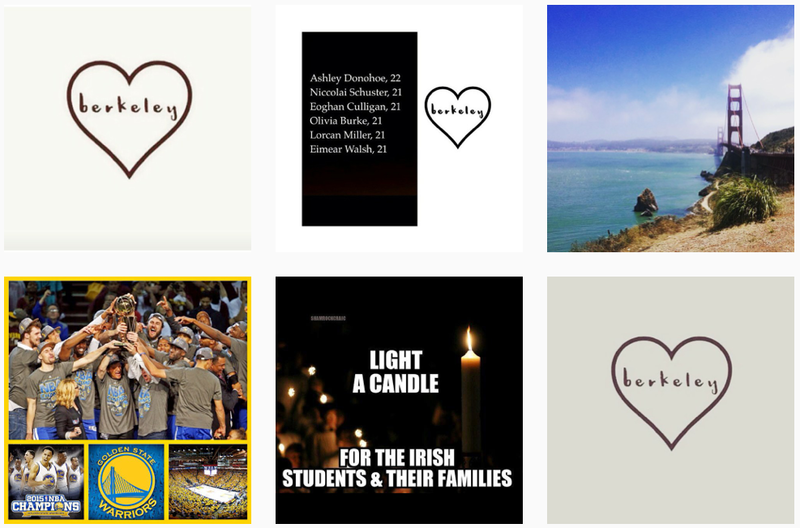 Click here to make a donation to the Irish J1 Berkeley Tragedy Fund. #BREAKING: 5 people have died following a balcony collapse on Kittredge St. in #Berkeley. Developing: 5 people are dead and 8 others injured after a balcony collapsed in #Berkeley overnight. We've learned moments ago some of those injuries are being categorized as serious and life threatening. Latest information at cbsnews.com. 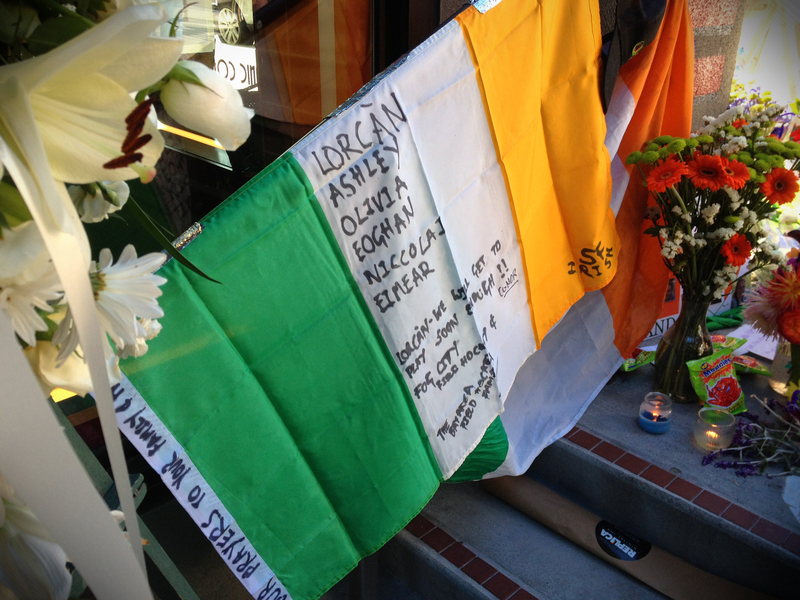 To our irish in #Berkeley, we are praying for you. Siciliana Trevino is Quirkeley’s Executive Producer and the Director of New Mo’ Cut: David Peoples’ lost film of Moe’s Books premiering at the Elmwood Theater August 27th, 2015.